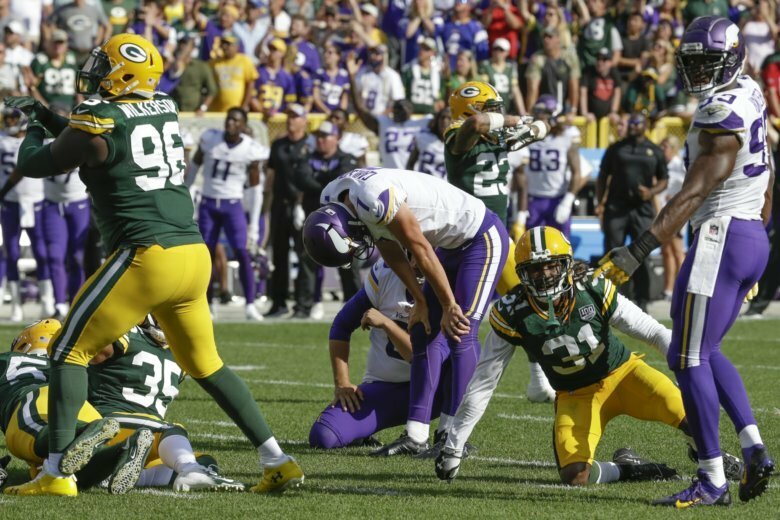 EAGAN, Minn. (AP) — The Minnesota Vikings have waived rookie kicker Daniel Carlson, after the fifth-round draft pick pulled all three of his field-goal attempts wide right at Green Bay. Two of Carlson’s misses came in overtime on Sunday, forcing the Vikings to settle for a 29-29 tie with the rival Packers. Carlson was promptly cut on Monday, as the Vikings signed wide receiver Aldrick Robinson. The Vikings didn’t immediately add a replacement for Carlson, but Zimmer confirmed they’ve invited free agent Dan Bailey to Minnesota for a physical exam. That makes it all but certain they’ll sign Bailey, who’s the second-most accurate field goal kicker in NFL history. The 30-year-old was released by the Dallas Cowboys right before the regular season began in a cost-saving decision, following his injury-influenced regression in 2017. Carlson was awarded the job when the Vikings let Kai Forbath go on Aug. 20, and Carlson pulled two field-goal tries wide left in an exhibition game four days later. He converted his only attempt, a 48-yarder, plus three extra points in the opener against the San Francisco 49ers on Sept. 9. Then came the debacle at Lambeau Field , after which Carlson acknowledged he’d lost some faith in his ability upon lining up for the 35-yard try on the last play of overtime. He missed from 49 yards earlier in the extra period and from 48 yards in the second quarter. “It’s disappointing for me personally. The team fought so hard. We expect to win that, and I expect to make those kicks to win the game for the team,” Carlson said. Since Zimmer took the job in 2014, the Vikings have had plenty of these problems. Blair Walsh never fully recovered from his 27-yard miss in the subzero cold of the playoff game against the Seattle Seahawks after the 2015 season. He was let go midway through the 2016 season in favor of Forbath, whose biggest trouble was extra points. He performed relatively well in 2017 as the Vikings advanced to the NFC championship game, but general manager Rick Spielman sought an upgrade with Carlson, who left Auburn as the all-time leading scorer in Southeastern Conference history.